← As expected, iWork was beefed up for the new iPad, bringing Keynote closer to parity with its desktop older sibling. But don’t fret, Keynote users: I think we saw some hints of new features of the next Keynote for the Mac. If memory serves correctly, reality TV shows have been around for about a decade starting with shows like Survivor and Big Brother. Others may argue that shows like Candid Camera, started and hosted by Alan Funt, were the real beginning in the 1950s, in the very early history of American TV. What Funt did was place ordinary people in situations designed to reveal something about them, where hidden cameras captured their unprepared responses to the sort of social situations social psychologists would love to set up, if only human ethics departments would allow. In the next generation of such shows, once more TV producers took “ordinary people”, meaning they weren’t yet TV celebrities, and placed them in extraordinary situations, such as Survivor and Big Brother. These have since crossed borders (Big Brother is one of a number of reality or talent shows produced and franchised by Dutch company, Endemol) and each culture has found its own way to reproduce the essence of each show to suit the nationality. This comes down to choosing the “contestants”, and the tasks they are given. Given the popularity of these early shows which had high production standards and resulted in high ratings, especially for the final episode where even those who hadn’t followed the whole series would watch to see the eventual winner, many new shows spun off. Some better than others of course. Please see Wikipedia’s voluminous entry here for a listing of the variety of shows working a similar formula. I want to draw your attention to two reality shows from co-producers Steven Lambeth and Eli Holzman. The first is a US version of an original British series called, Undercover Boss (UB). It first aired in 2010 and concluded its third season a few weeks ago. It has rated surprisingly well, confounding some of its critics, who see it as too unreal to be a reality show. The essence of the show is simple and straightforward: CEOs, Founders, or a senior executive of a large, national corporation agree to go “undercover” with both a physical disguise (some much much implausible than others) and with an alleged “cover” of being a contestant in a series looking at getting the unemployed or career changers back into the workforce. This explains the presence of a film crew covering the UB’s progress. During the show, the UBs travel to various corporate outposts and take on various “jobs” under the supervision of a carefully selected cadre of low level employees. In general, the UB comes down several rungs (the corporations are almost always multilevel from hardworking blue collar employees through several levels of middle and upper level management), and he or she takes on usually menial, physically challenging tasks, often working directly with customers, and for which they are pitifully unqualified and unskilled. This of course talks to our fantasies of bringing down the boss to “our level”, to see what life’s like for the other 99%. (The show invariably starts with a visit to the UB’s palatial home, usually complete with charming, adoring family). But to balance this schadenfreude, we consistently see two backstories occur in parallel. The first is the story of the low level employee who is to supervise and allegedly evaluate the UB, which sets up their transport to corporate headquarters where the UB reveals their true identity, one of the show’s reliable, emotional highpoints. The employee (we meet several as the UB travels the country) and UB usually take a break during the “training” and here we observe their story, usually one of heroic hardship, which tears at the UB’s heartstrings, setting up what happens in the last part of the show. Here, in usually tearful scenes, is when the UB reveals themselves, and turns the tables on the misled and shocked employee, espousing their worth to the company, their personal indomitable qualities, and the esteem they are newly held in by the UB. The second backstory is the UB’s own life hardships, usually framed within a family context, where the UB, most often a male, seeks to have the approval of their father, living or dead, who may in fact have been the company’s founder. There is a legacy to be managed, and rubbing shoulders with the hoi polloi or proletariat rehumanises the UB, brings them down to earth, and hopefully improves the company, within and without (i.e. its customer service). After the UB reveals themselves, there is usually some kind of reward to the lowly worker: perhaps some money for a child’s college fund or hospital treatment, or a charity donation or trust set up to help with a family member’s chronic illness, or the worker if young is offered further training or education at the company’s expense. Perhaps a marriage ceremony is afforded. These are usually tearful scenes with a surprised and grateful worker expressing astonishment that “I thought these things never happened to people like me”. The final minute of the show is spent telling us what has happened to the UB, the company and more importantly the employees in the weeks since. I think you can see from my description that while I am entertained by the show, it does become predictable after a few repetitions, with some UBs more compelling than others. How long the show can continue before employees twig is also a complication. The second show from the same executive producers is an original now in its early first season on the AMC network, the same cable channel which took a risk, ultimately hugely successful, with the period drama, Mad Men, devoted to Madison Avenue advertising companies of the late 1950s and early 1960s. That show has a cult following now, and I use various sections of it in my Presentation Magic workshops, featuring its main character, Dan Draper, and his descriptions of certain emotional states and how advertising exploits them to sell its clients’ wares. Lambeth and Holzman have now given us The Pitch, a reality show featuring in each episode two very different advertising agencies competing for the business of one significant client, who is releasing a new product or service, or repositioning or rebranding their iconic product. The show started six weeks ago and airs straight after Mad Men late on Sunday nights. Pitching for an advertising contract is standard practice in the corporate world with several agencies often approached and asked to make a formal presentation of their ideas after being briefed of the client’s requirements. Full fledged campaigns are not required, but sufficient understanding of the product and the market place is, and so the post-brief presentation to the decision makers is vital, given they will not see a fully formed advertisement but more a sketch outline demonstrating the agency’s concepts, often in storyboard form. They need to be convinced not just that the pitching agency has understood the brief, but has a means by which to achieve the desired results, whether that be increased sales or brand awareness. For the pitching agencies, it means putting talented staff to work with the strong possibility they will come away empty-handed without any payment for their pitch. But the lure of a possible multi-year, multi-million dollar campaign which if successful will also bring the agency attention and kudos, is very strong for even the most celebrated of agencies. The storyline for the The Pitch is quite simple: We early learn about the three central “characters”: The two agencies and their leadership group, with some personal backstories as well as information of previously successful campaigns; and the third of course is the client to whom they will individually pitch a week after the brief. The client may comprise the company CEO or Founder, and usually senior management, such as VP of product marketing, or an internal account director. Something a little unreal however occurs in this process, where the competing agencies are brought together face to face in a shared briefing session with the client. Each is deeply suspicious and withholding, perhaps not asking as in-depth questions as they could or ordinarily would lest they tip off the competition. It’s always amusing to see underlings racing to their Macs to check out the successes of the competition to know what they’re up against, in an effort to differentiate themselves. They then have a week before delivering the pitch, and invariably things start very slowly while ideas brew and ferment, then reach fever pitch, pardon the pun. There have been six episodes so far in Season 1, each of which is made available in iTunes TV the day after being shown (again, US iTunes store) for $2.99, or a season pass can be had which works out a little less per episode. I downloaded the first episode free, something iTunes offers to give new, untried programs a kick start. 1. The dominance of Apple equipment as the platform of choice in this creative industry, no big surprise here. 2. The use of iMacs, Macbooks and Keynote (the latter acknowledged by careful watching of Keynote-only transitions and animations) in each episode, where almost all the agencies bring in their own Macs to the client’s office to run the presentation visuals. No using USB drives with Powerpoint files to plug into the corporate Windows boxes. But additionally, the pitches do not rely solely on the Macbooks, with newspaper and magazine advertisements, and billboard mockups also shown. 3. The producers often misdirect us. There have been a few shows where the technology has fallen over, a wrong button is pressed, the TV displaying the ad doesn’t switch or the audio heard, or the presenter chosen by the agency – often new to the job and needing to impress – appears so anxious that we worry if they will freeze mid-sentence. Ultimately, this has nothing to do with the decision we eventually see portrayed. A poor man’s tension builder we can do without after a few episodes. 4. We do get a little insider’s view of the behind-the-scenes creative process, as the creative individuals and teams struggle to get across the brief. It’s edifying to see how the two agencies go about dissecting the brief in quite variant ways, and the internal battles the creative teams they must deal with to get their ideas into the final mix. 5. We see little evidence-base marketing except from the client themselves who often come to brief the agencies with focus group and market research. They are usually very clear and firm with what they want to see happen and the rigidity of sticking with the brief. Within the agencies, there seems little testing, and much self-confidence that their ideas will sell themselves, almost self-evidently. Perhaps that’s the only way to survive in the advertising industry, and pointing at your awards on the office shelf, something conspicuously filmed by The Pitch producers. 6. While older, experienced heads lead the agencies in terms of hearing the brief, they usually assign the pitch to teams of much younger staff, each of whom is very IT savvy. They in turn compete for the old heads’ attention, and who will ultimately do the pitch. 7. In the most recent episode (#106), we see two very different agencies, one specialising in multicultural issues (with a culturally diverse team) in Culver City, CA, and another from the mid-west (Omaha), and each compete for the job of rebranding a not-for-profit health service, the Juvenile Diabetes Research Foundation (JDRF). chosen because it can be paired with an iPhone using a specific cable and software to record measures, which can be forwarded to treatment specialists. Users must draw a small sample of blood from a finger tip using sharp device and the drop of blood is placed on a small strip inserted into the measuring device (at the black dots on the strip). The edginess of the campaign, an effort to combat the rise of diabetes 1, is symbolised by its theme: “One less prick”, referring to the daily grind of multiple stabs to draw blood. For conservative America, when I watched this plan hatch, my immediate thought was it would be shot down in flames by JDRF. The mid-west agency, Bozell, went with a more vanilla approach, “Be the voice of One”. I won’t reveal who won, which – spoiler alert – you can discover if you go the AMC website. I want however to draw your attention – those of you who want to learn about the applied skills of presenting – to what occurred in this episode, which might encourage you to see it for yourself. One of Muse’s young creatives, Marcus, who came up with the “One less prick” theme, is short of presentation experience, yet is encouraged by agency owner Joe Muse to conduct the pitch to the JDRF. 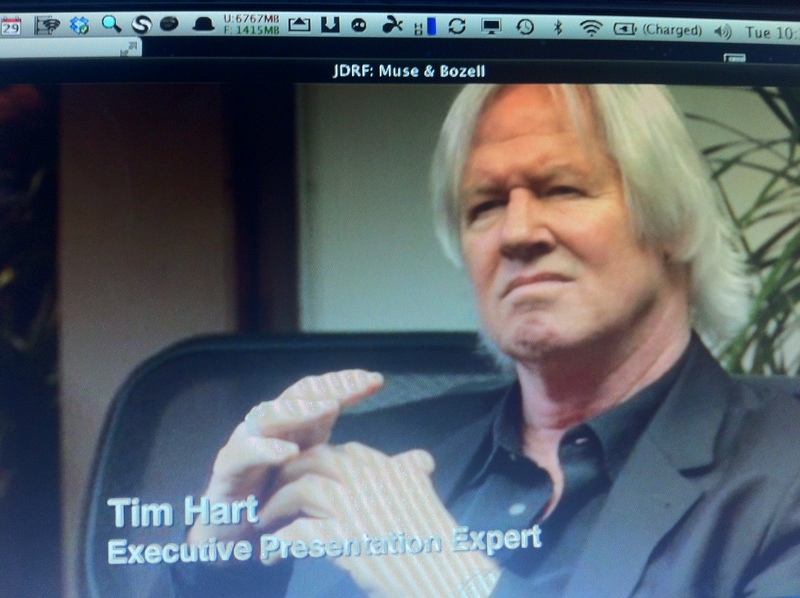 It will be his idea and his presentation that will be crucial to Muse’s success or failure. We are once more misdirected by the producers because Marcus presents initially as self-confident, if not cocky. Joe Muse however, recognising Marcus’ lack of experience, brings in a heavy-hitting presentation training guru, Tim Hart, (left) who Muse introduces as an “Executive Presentation Expert”. Customized Presentation Skills training and presentation skills mastery, Automotive Marketing and Advertising expert, Keynote Speaker, Personality Profile training, C-level Coaching and Consulting, Expert Group Facilitator, Generational Differences Training, Personal Image consulting, Personal Branding Expert, Branding CEOs, Expert in creating Vision, Mission, Purpose statements for companies and organizations. In front of his assembled team, Marcus is to practise his presentation under the guidance of Hart. Now I’m not sure whether the next part is played up for the camera or whether this is how Mr. Hart prefers to work, but poor Marcus has strips torn off him in front of his peers, making numerous false starts which get quickly corrected. The advice and guidance is all fine and dandy, but perhaps the stripping bare is part of the toughening up process in the hope of helping Marcus deal with any performance anxiety when it really counts. 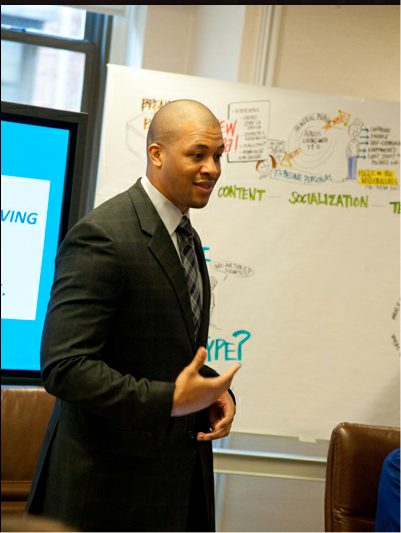 At one point in his presentation to the client, Marcus freezes, seemingly overwhelmed by the task. He rescues the situation, but will it be enough for Muse to win the project? In each episode of The Pitch, before they deliver their verdict to the agencies, the client evaluation panel is seen discussing the pros and cons of the two pitches, but we never see them making their decision. We only know what it is when, in turn, they ring each agency with the good or bad news. For me, that’s a huge gap, and I’d rather see more depth given to the feedback and evaluations, rather than each weekly generic “we felt the other agency came closer to what we wanted in a our brief“. Luckily, there are some very clever people who can assist, and as it turns out prior to watching the video, you are assailed by a 15 second advertisement. Having someone in Australia count as a viewer of a local product advertisement, perhaps selected by the IP address the site recognises, would distort the advertising metrics, I presume. What comes out of the video is the emphasis the client placed on the stories told by the agency, and how those stories could be extended into a variety of scenarios the client hadn’t considered previously. That’s a great match, because it says the agency truly understood the brief, and actually went beyond it in their storytelling and presentation. In essence, it’s a little like how Apple works: Underpromise and overdeliver and let the end user ask how Apple “knew” more than they what they really needed. I think a few more agencies would do well not just to study how Apple markets, but also Apple’s ethos in delivering quality products which, when first introduced, have the tech pundits giving a thumbs down, but the buying public usually saying otherwise – with their credit cards. I plan to incorporate more of The Pitch in my future Presentation Magic workshops to illustrate a variety of presentation concepts. If you’re in the US, you can further study the pitch concept on TV with shows like ABC’s Shark Tank, which was derived from a UK show called Dragons’ Den. Here, budding entrepreneurs bring their product and pitch to five self-made wealthy individuals from whom they seek seed money for a percentage of the profits or equity. Because I feel a little guilty for leaving my blog unattended for so long, may I reward your wait with this mashup of what might have happened if Steve Jobs had pitched the iPad in the Dragons’ Den. Enjoy! This entry was posted in iPad, Powerpoint, Presentation Skills and tagged advertising, AMC, Keynote, Macbook, Mad Men, The Pitch. Bookmark the permalink. Muse needed more than a presentation coach- they needed to bring in some people to help with the assignment since they predicted it was outside their multi-cultural arena. Predicting you won’t connect with the client almost guarantees you won’t. Thanks David, I had neglected to mention your website which I noticed at AMCtv.com, and some of the comments which were very interesting and insightful. Watching the show at delishows.com is news to me and I will check it out. Ta. 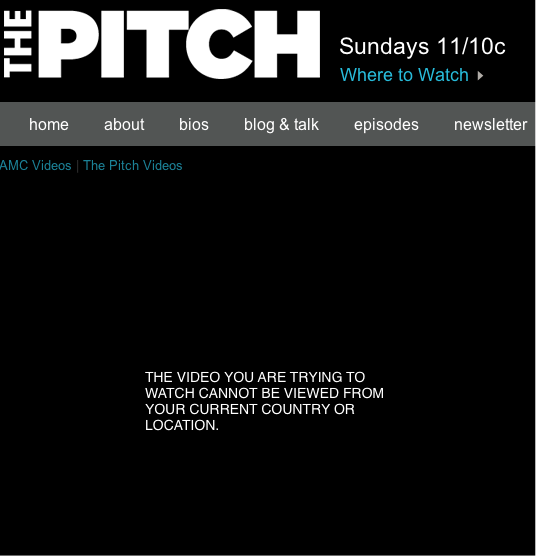 I commend readers to follow your nextwave.biz site for more commentary about The Pitch. I think you may mean diabetes type 2, not type 1. No, Juvenile diabetes is classified as Type 1, while adult-onset, Diabetes Mellitus, is Type II. It’s the latter that also has governments in a spin since it’s lifestyle-related, and thus preventable and even curable. I don’t believe Type 1, which is diagnosed early in life, is preventable, and requires daily insulin, but I am happy to be corrected. Not all Type II requires insulin, and can be treated – that is glucose levels kept to normal levels – with medication, exercise, and nutritional shifts, as well as loss of weight, ie reduction of BMI. It can be reversed in certain situations. This is not the case in Type 1. 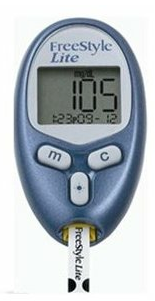 What they have in common is the need for daily glucose monitoring.